So, if you knew me, you would know I am not one for gardening. I can't even keep a house plant alive. Yet... for some reason I can't stop buying them and trying. This however was something different. A birthday present for D's mom who loves plants and gardens and all things of those sorts. I purchased a terrarium from Etsy. A nice little shop with a good reputation and adorable stuff. 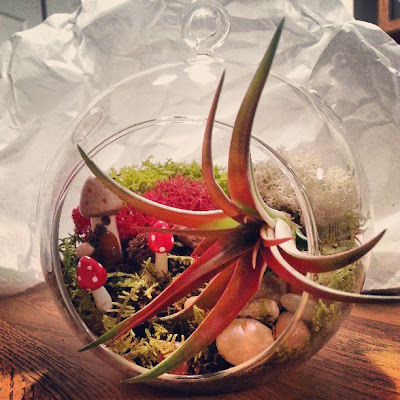 Take a look here: Lush and Lovely Terrariums It was a perfect transaction. I had inquired about switching out some accessories in the kit I wanted and Mike was nothing but helpful. When the box arrived, everything was perfectly packed and I was excited to assemble. After I set the plants, rocks etc inside, I added some jute to the top for hanging. My only regret was not buying a few gnomes to include. The best part of this whole process was that D's mom loved it! I'm starting to think I should have bought two so I could have my own. But then again... maybe I will just enjoy hers from afar. I would most certainly buy from Lush and Lovely Terrariums again.